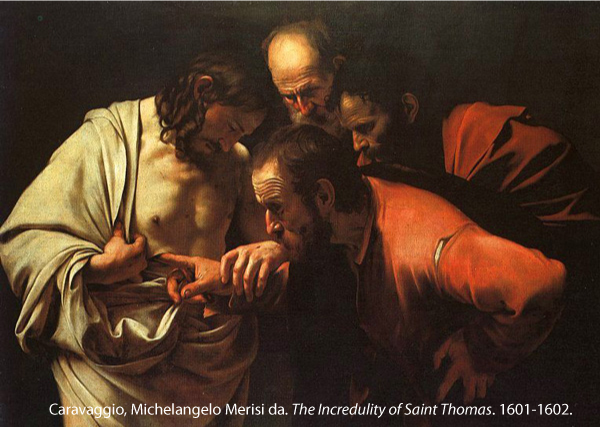 Dear Friends in Christ: from the Gospel text for this coming Sunday (John 20:19-31), the Sunday now following Easter, and the hope we’ve been given in Christ’s resurrection … now comes the famous caricature of one of Jesus’ beloved disciples: Thomas. Oh, I know we’ve labeled him. Somewhere, in some sermon, someone laid down the label, “Doubting Thomas.” And the name stuck.// And to a degree, yea, it’s true. Thomas did harbor some serious doubt. However … it’s just that there’s a whole lot more here than “meets the eye” … (John 20:29-30; cf. II Corinthians 5:7 and Hebrews 11:1). We’ll also be drawing upon a large canvas “study” (by local Ethiopian artist, Eyab Mergia) of Caravaggio’s classic painting, “The Incredulity of Saints Thomas.” As you look at the small posting of it here, let me ask you: “In Carvaggio’s well-known technique of chiaroscuro (Italian meaning, “light-dark”) where in the subject matter of the painting does the light appear to be emanating from?” Moreover, “Is there something striking to you here, how Thomas’ finger is placed in Jesus’ wounded, yet resurrected body?” And finally, “Don’t you find it curious that Thomas’ eyes aren’t fixed on the place where his finger is touching Jesus’ wounded side … but rather, where?” Come and see!